When degrees become the norm, whatâ€™s a parent to do? To be sure, Singapore doesn’t have a problem with youth unemployment yet. And surveys show that graduates from local universities are able to get good jobs fast. But many people are going overseas or to private schools for degrees, some of dubious quality. Some graduate with law degrees not recognised back home. Employers also say they often pay less for those with degrees from less-known institutions. The message here for parents and students is: Don’t rush after a degree at any cost. That’s one reason why there’s been all this fuss lately about the Aspire committee to improve ITE and polytechnic vocational education so people can advance and improve in their skills. Ministers have weighed in on the issue, as have academics. Many have asked if the message is that a uni degree is now less relevant. If anything, one can argue that it’s become more relevant. Two figures explain the urgency among young people and their parents to aim for a degree. 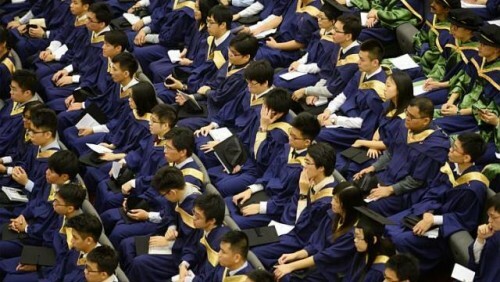 The first is that one in two young Singapore residents have a university degree. That’s for those aged 25 to 35. For those in their 60s, it’s just one in five who has a degree. No wonder every late teen now feels he or she must get a degree - when half your peers are going to get degrees, you want to fall into the right half. The other figure is that three in four Singapore residents has tertiary education - which means a diploma or a degree. In other words, for young Singaporeans, a diploma will become the absolute minimum to aim for. And a degree is no longer for the more academically inclined “above average” student. It’s become the norm. It’s very likely that among those in their teens today, the proportion of degree holders in their cohort - when they reach their mid-20s in 10 years’ time - will hit 55 or even 60 per cent. The paper chase shows no sign of letting up, and I don’t think this latest push for vocational skills training is going to change things. But what parents and students must realise is that a degree no longer promises a short cut to a good life. Degree holders are more likely than diploma holders to be laid off. That’s what our senior education correspondent Sandra Davie said in a commentary on Aug 26. Smart parents and students will thus be realistic about their options. For the clearly academically inclined, a degree is a natural route. For the technical-minded, a poly or ITE is the right choice. It’s the median student who faces a dilemma. Struggle through O levels, then junior college, and hope to get into some university? Retake the A levels as a private candidate and hope to get better grades to get into a local uni? Or opt for the poly route? For some median students, a skills-based course might be more sensible. And if they find something that fits - say, process engineering, aircraft maintenance, nursing - there is nothing to stop them from pursuing their skill in future, all the way to a Bachelor or Masters degree.